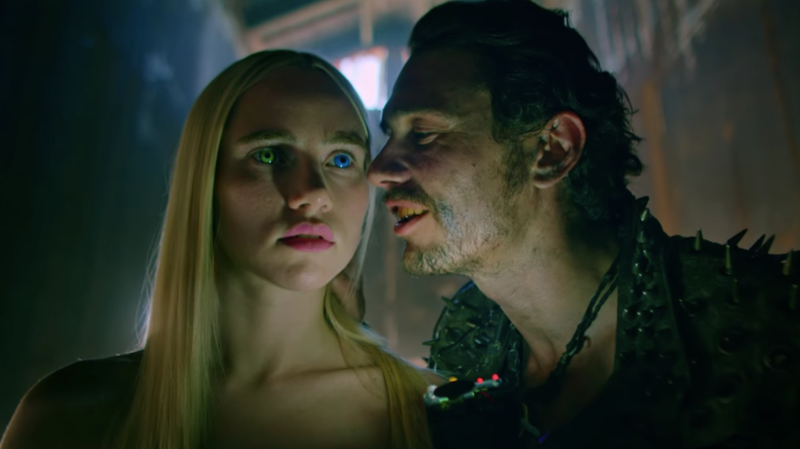 James Franco, whose résumé as a director is as extensive as it is undistinguished, leaves behind the misbegotten literary adaptations that have been the bedrock of his filmography to try his hand at a sci-fi B-movie in Future World, co-directed with repeat collaborator Bruce Thierry Cheung. In a post-apocalyptic future that borrows freely from more impressive visions of humanity’s decline, a prince (Jeffrey Wahlberg, nephew of Mark) leaves his community in search of the fabled Paradise Beach, but soon crosses paths with a psychotic gang leader (Franco), a killer android named Ash (Suki Waterhouse), and assorted wasteland scumbags in spikes and leather. 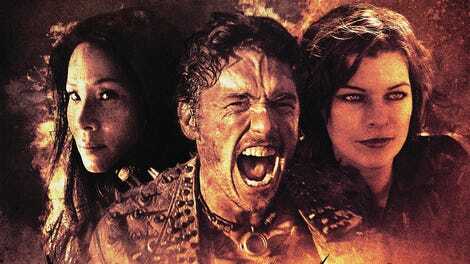 Only the bizarre ensemble cast—which includes Milla Jovovich, Lucy Liu, Snoop Dogg, Method Man, and, uh, Twin Shadow—sets this ersatz Mad Max apart from any number of direct-to-video titles. Yet Future World falls short of even those modest standards, as Franco and Cheung’s unorthodox approach of directing almost the entire film in random, nomadic Steadicam shots with wobbly zooms alienates the simplistic plot. As with almost all of Franco’s directorial efforts outside of last year’s The Disaster Artist—his first mainstream success, and possibly the only one of his narrative features that’s watchable from beginning to end—the very existence of Future World is confounding. It’s too sloppily tossed-off to qualify as an homage to post-apocalyptic chase movies in the vein of George Miller and too under-conceived to hold anyone’s interest, including the camera’s. (The title itself is so generic that it’s already been taken by two movies, including the sequel to the original Westworld.) Wahlberg, who is notably absent from the advertising despite being the film’s nominal protagonist, is such a forgettable presence that he sometimes disappears into the crumbling walls, rusty pipes, and randomly trailing wires of the scenery; Waterhouse is in turn called upon to act robotic, and complies. The fact that most of the characters are unnamed speaks more to a paltry imagination than to any mythic qualities; despite some half-hearted attempts at establishing fairytale-Western qualities for this post-whatever wilderness (the guns are all six-shooters, and our hero is on a quest to find a magical cure for his dying queen), Future World is ultimately the kind of movie that slaps a leather duster on Snoop Dogg and has him play the pimp king of a badlands brothel called Love Town. The film’s side trip to this fiefdom—a rusty steel mill filled with go-go cages, neon lights, cheap T&A, and exposition that sounds mostly improvised—somehow counts as a highlight. The violence, wonky camerawork, and snickers of humor (mostly courtesy of Franco’s tongue-flicking, yellow-teeth-baring, one-note performance as the bad guy) places Future World a notch above Franco’s somnambulant John Steinbeck adaptation In Dubious Battle. (Still, it lacks the cheap shock value of his take on Cormac McCarthy, Child Of God, which offered up an unintended self-summary in a single unshakeable image: pointlessly unsimulated shitting.) But its blasé attitude to the basics of movie action turn the video-game-esque quest plot into an exercise in tedium. The closest thing it has to an energizing presence comes from Jovovich’s manic turn as the leader of a community called Drug Town. It seems that even post-apocalyptic junk is best left to the experts.